WHEN BEACH RESTORATION DEPENDS ON LEAVING NATURE DO IT BY ITSELF. CASE OF SAN BRUNO, YUCATAN, MEXICO. The interaction that occurs between the wave incident and natural or anthropogenic structures, along a beach system, gives rise to littoral cells, where the sediment can be moved inside the cell and/or passes from one cell to another (Anfuso 2004).This exchange of sediment allows stability to a beach system. However, said stability is sensitive to any alteration to the longitudinal transport of sand, induced by the current parallel to the coast product of the swell. Sand erosion/accretion processes in a given segment can be caused by anthropogenic interventions several kilometers away from the affected area. It becomes a priority for any intervention, ensuring the compatibility of the coastal processes of the system, with the specific action in a beach segment. 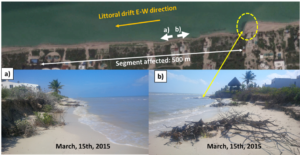 This is the case of the San Bruno beaches in Yucatan, Mexico, where permanent erosion patterns in recent years led to aggressive interventions that did not control the affectation in the downstream beach area. Subsequent monitoring and reengineering allowed the erosion to be reversed, as well as ensuring the NO involvement of nearby beaches. The present document presents the initial problem, the intervention for beach recovery based on submerged breakwaters, the reengineering product of monitoring and adjustment actions. Beach widths have been recovered at the levels of 2 decades ago with a minimum of interventions. The system is permanently monitored to ensure its sustainability in the medium and long term. Further exposed, there are also some examples of anthropogenic impact actions in the area, and how the beaches have responded when interventions have been reduced and allowed natural processes to take care of the recovery of the beach on their own. The beach system located between Progreso and Telchac on the northern coast of Yucatan, Mexico, with a length of 37 km (figure 1), is subject to the same coastal dynamics. In the last decades, numerous interventions have been carried out to stop different erosive processes of different magnitude within the system. On many occasions, the interventions, although they seem successful, only detonate new erosion problems in the contiguous beaches towards the west (net direction of sediment transport). These structures are basically groynes (locally known as spurs) and submerged breakwaters. Both types of structures have proven their punctual efficiency, but at the same time the risk they imply in the littoral cells, when they are not designed with an integral vision. The present document shows San Bruno´s case, where the placement of grois on continuous beaches only broke the balance of a healthy beach system. The subsequent intervention with submerged breakwaters punctually repaired the eroded beaches, but continued to transmit the problem westward. Currently, submerged breakwaters, reduced from their original design, coupled with the control of keeping the system in equilibrium without punctual structures (transversal or parallel to the beach), have restored stability to several kilometers of beach. This has shown the importance of identifying beach systems that only require a minimum of works or even no intervention to guarantee their natural stability. Likewise, the risk of placing coastal protection structures, bypassing regulations and without an integral vision of coastal management becomes evident. These only generate a domino effect of erosion in the direction of sand movement, not considering that sediment transport feeds all the beaches through the same littoral dynamics. Figure 1. Location of the study site between Progreso and the Port of Telchac in Yucatan, Mexico. Demonstrate the risks that specific interventions against coastal erosion can pose for the coastal cells without a comprehensive perspective. Discuss the importance of evaluating the removal of anthropogenic actions as a measure of shoreline regression mitigation and allow beach systems to stabilize and recover on their own. Description of the Telchac beach system – Progreso. Appendini et al. in 2012, estimated the net coastal transport in the north coast of Yucatan, in a magnitude order between 20,000 and 80,000 m3 / year in direction E-W. It is considered that, between Telchac and Progreso, all the beaches are subject to the same littoral dynamics and it is accepted that the Telchac fishing refuge has been an important cause of the reduction of sand movement. The reintegration of the flow of sand in W direction, of the sediment retained in its eastern breakwater, is essential for the sustainability of the system; see Figure 2 (López Gutiérrez 2011, Manrique Sanguino 2012). The lack of an integral solution that implements a permanent sand transfer in the Telchac breakwater has triggered the proliferation of punctual structures on numerous beaches that are unsustainable over time (Figure 3a). Likewise, other zones have maintained a strategy of putting the minimum of interventions to favor the free circulation of sand (Figure 3b). Both solutions have been applied in systems with similar wave dynamics, bathymetry, tide and sedimentological conditions. It stands out that in such a short segment of beaches exposed to the same dynamic (2 km distance), there are stable and balanced stretches, at the same time as sections in conditions of permanent erosion and far from achieving a sustainable balance. Taking as a basis that a beach in equilibrium is one that has its “dune-beach-submerged bar” components working together over an average year (Figure 4), in the case of the beach system in question, this Balance profile is broken in greater magnitude in the sections where there are too many structures. At the same time, the zones that bet for a reduction or total elimination of structures when possible, present natural conditions of stability that guarantee the sustainability of a beach stretch in the medium and long term, as will be shown below. The case of the beach located on the east side of the site known as San Bruno on km 31.5 of the Progreso – Telchac highway (Figure 2), exemplifies very clearly what was described in the previously. Being this zone a stable system of beaches, and before an erosive process of smaller magnitude, caused among other reasons, by the lack of the mentioned transfer of the Port of Telchac (6 km East), it was decided in the beach bordering to the East, to implement a solution of transverse groins (breakwaters) based on geotextile tubes, causing a devastating effect for a section of around 500 m (Figure 5). Due to the gradual retreat of the coastline in recent years, in the second half of 2016, it was decided to intervene specifically in the affected community, where the design of two submerged breakwaters, parallel to the coast, was chosen. Its objective was to reduce the transmission of wave energy through these structures and favor the sedimentation of the sand in suspension within the longitudinal current parallel to the coast. The breakwaters were made with geotextile tubes, which offered great advantages due to its easy implementation and more importantly, its flexibility to be modified or removed at minimum cost and in less time, taking into account other conventional alternatives, such as natural rock or concrete elements. Figure 6 shows the general plant and type section, as well as the expected shoreline stabilization. 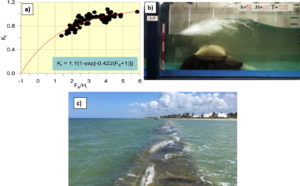 Wave analysis and numerical modeling works available to date, for the behavior of submerged breakwaters in Yucatán are found in the studies carried out by Suárez Bilbao in 2014, Manrique Sanguino in 2012 and Suárez Bilbao & Enriquez in 2016. Regarding the structures geometry, it was determined to be capped at the Mean Sea Level (MSL) to obtain wave transmission of between 50-60% of the incident wave, in order to reduce the moving sand and favor its stabilization on the beach. This geometry was defined based on the “freeboard – incident wave” relation, result of the physical modeling in the 2D wave channel of the II-UNAM, extrapolated for wave conditions and morphology of the northern coast of Yucatan (González et al. 2014) according to Figure 7. This criterion is only an approximation, and to date there is no information with greater precision to determine the wave transmission coefficient in place, due to the effect of submerged or semi-submerged breakwater structures. Figure 6 Plant and section type of submerged breakwater in San Bruno. Figure 7 a) Coefficient wave energy reduction (Kt) based on Franco board (Fb), and incident wave (Hi) (reference 5). b) Laboratory Modeling. c) Operation in San Bruno. The coastal stretch of San Bruno has been permanently monitored in the last 2 years. Its behavior has been as expected in terms of sand accumulation in the “shadow” of the breakwaters (Figure 8a and 8b) due to the reduction of wave energy. However, the retained sand accumulated at an excessive rate with the consequent impact on the beaches of the West. 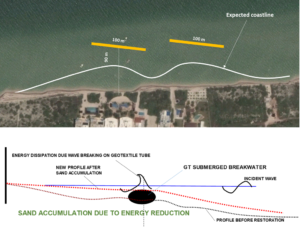 Through permanent profile monitoring performed on a monthly basis using the BeachPro® tool (Axis Ingeniería 2014, Axis Ingeniería 2018), the distortions caused by the excess sand retention were quantified (Figure 8c). In October 2017, the length of the breakwaters was reduced at the same time that their capped level was reduced and their freeboard increased to favor a greater wave energy transmission of the order of 80-90% (Figure 9). The results of these measures became evident in the short term. Currently the beach system is stable and with beach widths similar to those existing 2 decades ago. (Figure 10 and Figure 11). monitoring campaign for the San Bruno neighborhood community. Figure 9 Modifications made in October 2017 and conformation of the coastline before and after the intervention. This solution was complemented with the removal of transversal structures east of the breakwater area (Figure 12), corresponding to the origin direction of the net coastal transport. The final result is a stable beach system, with an acceptable dry beach width that allows a favorable coastal dynamics for the nearby beaches. It is evident, on the northern coast of Yucatan, the lack of a comprehensive perspective on interventions for beach recovery. All beaches in this region are subject to the same oceanographic conditions (waves and currents), morphological (sea bottom) and geological (same sand in quantity and quality). However, there is a strong erosion tendency as the beaches are more intervened with coastal protection works (figure 3). The Progreso-Telchac beach system is affected by the retention of sand on the eastern side of the Telchac port (figure 3). Implementing an efficient sediment system transfer that restores natural conditions of sand movement is essential. Meanwhile, a minimum of structures should be put in place to correct sections of high vulnerability to erosion, prioritizing the circulation of sand in the system above the point retention. In the case of San Bruno, where a breakwater solution was implemented that allowed an incident wave transmission of the order of 50-60%, excess sediment was retained forming a sandbank that interrupted the longitudinal transport. To solve this, its length and capped height were reduced to increase its energy transmission above 80% and decrease the retention rate. This analysis only applies to this case, given that each beach must be treated individually to be able to estimate the appropriate retention rate of sand so as not to generate distortions in the system, that accelerate erosion in adjacent beaches. The lack of knowledge in the littoral haul in Yucatan, which allows knowing precise coastal transport rates each time of the year, makes it highly advisable to implement flexible solutions that allow a quick intervention, at the lowest possible cost. This facilitates the ability to react, to the extent that the marine response requires it. In the case of San Bruno this was very evident. At the moment it enjoys healthy beaches, due to the immediate intervention capacity based on easily modified and removable geotextile tubes allowed. Regarding the design of the submerged breakwaters, the case of San Bruno demonstrated the high sensitivity of the response of the coastline to wave transmission. For this design, Kt wave transmission coefficient values (figure 7) obtained from laboratory analysis in 2D wave channel was used with the limitations that this implies. Field research that allows a better knowledge of this coefficient will make the tools currently available for design more efficient. Although the specific intervention in San Bruno has worked, the stability of the section is conditioned to the control of sediment transport in the East to the Port of Telchac. Any intervention in this area that does not consider a comprehensive approach respecting the natural dynamics of beaches can trigger a new regression of shoreline in now stable beach segments. Once a sand transfer system is implemented in Telchac, it is foreseeable that the coastal dynamics will recover its natural rate of longitudinal transport of sand. The partial or total removal of structures applies both in San Bruno and in all the beaches intervened as the best measure to have a sustainable beach system. 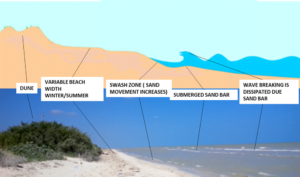 1 The 37 km stretch of coastline located between Progreso and Telchac shows its most vulnerable segments due to the regression of the shoreline associated with numerous erosion control interventions. On the contrary, the more stable stretches coincide with low or no structures density implemented for beach recovery. To date, there is no comprehensive beach management program in Yucatán. The actors involved in its implementation (authorities, academic centers, consultants, contractors and users) have to decide on a strategy that goes through increasingly rigidifying the system (based on controlling and retaining the sand movement through more beach protection works) or making it more flexible, eliminating gradually anthropogenic actions to restore the natural movement of sediments, as well as sand transfer from Telchac. Only the second option is considered sustainable in the long term. In the case of Yucatan, the attempts to control the times for restoration in specific stretches, has usually detonated in wrong decisions. When natural conditions have been allowed to restore specific segments without interventions, the results in terms of environmental sustainability have been far superior to any anthropogenic actions. It is very evident in Yucatan that sometimes the only thing that is needed to recover a beach system is eliminating all anthropogenic actions that interrupts the sediment transit and allow nature to take charge of recovering its natural balance. The authors are grateful for the support throughout all the activities linked in this work, from the neighbor’s community of Kayab condominiums in San Bruno and from the Secretariat of Urban Development and Environment of the State of Yucatan. PAPER presented at the XI CONGRESS OF SCIENCES OF THE SEA.